The studio is humming as I prep my Shibori Chic clothing and some small works for both the Tucson Open Studios Tour and the Tubac Holiday Artisans Market this week. I will have my discharged rayon scarves and t-shirts in addition to some new rayon/silk burnout scarves I am trying for the first time. These are dyed in some beautiful colors–an elegant and unique way to keep the chill off. Some photos are below. I also got some great results with a different binding technique this year…..check out the black and white scarf in the top left hand corner. Stop by my temporary studio at 3231 N. Craycroft Rd. (St. Gregory’s School Classroom 1) on Saturday or Sunday between 11 am and 4 pm. 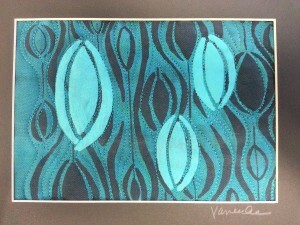 I will be sharing it with five other fiber artists who will be demonstrating some of our techniques. My plan is to work on a new (to me) process called paper lamination, where paper is glued (laminated) to sheer fabric which can then be layered on other fabric and stitched or felted. It offers many interesting possibilities for my upcoming work. I have some small samples I am happy with, so it is time to try it in some actual work. Warning: these photos are quick snapshots. You need to see them in person to see how great the colors are! 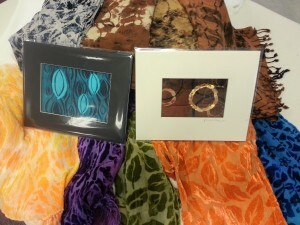 Some scarves and small works that will be available at the Open Studio Tour. A turquoise ‘Little Gem’ that is hand-dyed, screen-printed with some new images I have been trying, and layered and stitched. 8” x 10” matted. A ‘Little Gem’ with several discharging media, metal leaf, and stitching. 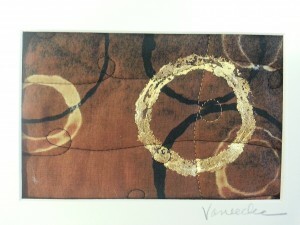 It is 8” x 10” matted.